WEST MIDLANDS based Willmott Dixon scooped two top accolades at the West Midlands Insider Property Awards last week (19 November) for its state of the art Curzon Building at Birmingham City University (BCU) – receiving both the Sustainability Award and title of Construction Project of the Year. The £46 million project was delivered for BCU as part of the regeneration of Birmingham’s Eastside and aimed to deliver a new university building and sympathetic restoration of The Eagle and Ball public house, which dates back to the mid-1800s. Willmott Dixon worked closely with Associated Architects on the project, and were praised for raising the bar in construction by judges on the evening. The innovative six-storey teaching block met all of BCU’s requirements, creating a home for business, English, law and social sciences students in an innovative and modern way. 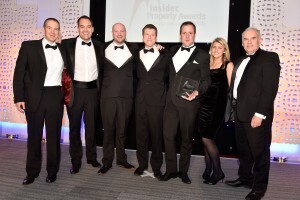 The West Midlands Insider Property Awards were hosted at the Hilton Metropole Hotel in Birmingham (19 November), and celebrated pioneering businesses in the industry across 12 award categories. Peter Owen, managing director at Willmott Dixon, which has a regional construction base in Coleshill said: “It is a real honour to receive two awards for the Curzon Building, and we are very proud of this project’s success. The BREAM excellent project exemplifies both sympathetic restoration and regeneration, which resulted in the Curzon Building winning in both of the categories it was shortlisted in. The 24,300m2 building has brought together the university’s business, English, law and social sciences departments in addition to a student support hub, new library, teaching and IT space. The Curzon building is now acting as a central building for many of the city’s students and staff. During the project, the Willmott Dixon site team used BIM L2 throughout, allowing them to work collaboratively with the other parties involved with the project in an efficient and cost effective way.